Now is the best time to check your equipment, restock your supplies, clean your stuff and do any fix-up that might be called for. There’s absolutely nothing more tortuous than being able to smell a neighbor’s cookout and not being able to have one of your own. But don’t worry, we’ve got your back. While you’re at it, you may want to look at these other maintenance items that start to pop up as winter’s ice starts to recede. Getting ready for spring can start while winter is still finishing up, provided you have several nice days in a row for surfaces and finishes to dry properly. Even if it does snow again, it’ll just be a matter of rinsing the new layer of dirt away. Once you’re starting to see more than a few days in a row with night time weather above freezing, you’re probably good to get started. Depending on your patio or deck’s surface, a simple sweeping with a broom and a hosing may be all you need to do. Other surfaces might need a power washing and resealing. You’ll have to judge this based on how the material reacts to your efforts. If water beads on the surface, you’re probably ok to skip the sealant here, too. For decks, make sure you drive any popping nails and replace any that have gone missing. 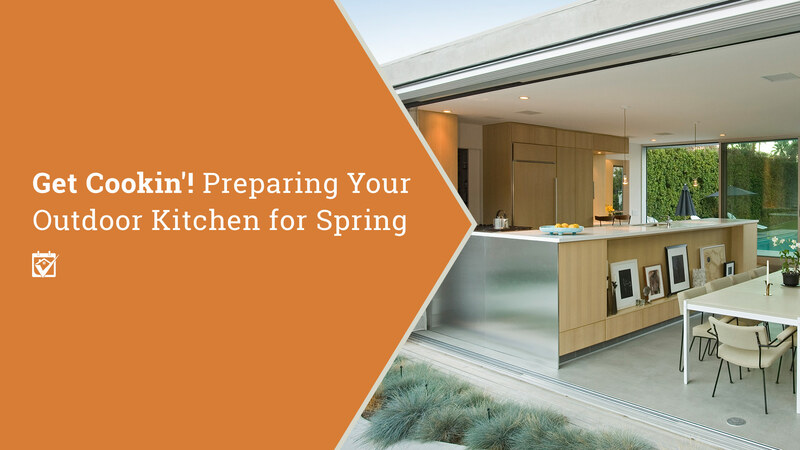 There’s no one definition of an “outdoor kitchen,” so what sort of appliances that this may entail can vary wildly from a charcoal grill with a side table to a high end gas number, plus a full size fridge, wine fridge, ice maker, sink with disposal and so on. Seriously, you didn’t think we’d let you go without restocking the larder, did you? Your surfaces are clean, your appliances are ready to go (the pros even said they’re in great working order! ), but what about all that little fiddly stuff you’re always running out of: disposables like plates, cups, plastic ware, paper goods? Now’s the time. They never go bad and you can keep them inside if necessary. Your outdoor kitchen is ready to go, all you need is enough nice weather to invite a few friends over for a big flamin’ cook-up. The waiting can be excruciating, though. While you wait, you can work on other outdoor projects to make your patio or deck space even more inviting, even if you’re not all that handy. Just call one of the experts available through HomeKeepr. They come recommended, so you know they’re skilled people you can trust to help you get the party started. Next Are you really ready to buy?